Free standard delivery on all UK orders. 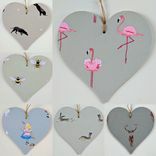 Receive 25p discount per hanging heart when you purchase more than one! 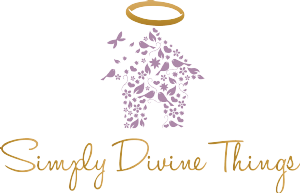 Discount applied automatically when products are added to your basket. Terms and Conditions apply. Standard delivery to the UK is free. An upgrade to first class is available for £3. Delivery to Europe will be £4 for all items except tiles, for which a charge of £4 for every 4 tiles is made. We are not able to deliver outside of Europe at this time. 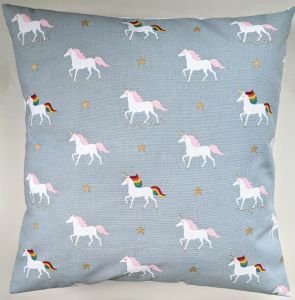 Cushion Cover in Sophie Allport Rainbow Unicorn 14" 16" 18" 20"
Item: Cushion cover in Sophie Allport Rainbow Unicorn, handcrafted by Simply Divine Things. Size/s available: 14" 16" 18" 20"
Colour/s: Multi, sky blue background. Fabric on reverse: Plain white. Washing instructions: Machine washable at 30 degrees. Do not tumble dry. Composition: 100% cotton outer, polycotton lining. Further information:We make our covers slightly smaller than the pad size required to give a snugger fit. Envelope closure. The exact print will vary from cushion to cushion. Pad not included. Size 14" x 14" 16"x 16" 18" x 18" 20" x 20"